A majority of people when they hear the facts about GreenLight decide that it is a bad deal for Pinellas County and indicate they will vote NO. The problem is the only serious effort to get the facts out is taking place right here where you're reading... Social Media. Big news organizations are reluctant to go against powerful advertisers like the Board of Realtors, and the Chamber of Commerce with all their members.. Big media needs the ad revenue. Quite frankly No Tax for Tracks is out gunned in the money department by several fold. The Polls consistently tell the story. As pollsters ask more detailed questions about the sales tax increase, reluctance turns in to opposition. So here is what you can do. Up there in the picture are three icons that are the key to getting the word out. Somewhere on every Blog page and on-line newspaper article are a series of boxes with those ICONs. If you click the one that looks like an envelope you can mail the post your reading to up to five e-mail addresses. So every time you see something about the sales tax that you think is good information, click the e-mail envelope and send it to 5 friends. You can click the envelope and send to as many groups of 5 as you want. While you're at it, ask your e-mail contacts to forward the post to five of their friends. That will spread the word. Use Facebook and Twitter to like Posts you think are relevant and let your friends see them. Check out my video Post GreenLight - It's a Bad Law . If you agree with my thinking, e-mail the post to everyone in your contact list and ask them to do the same. Help save this county from the biggest tax grab boondoggle in Pinellas County History. 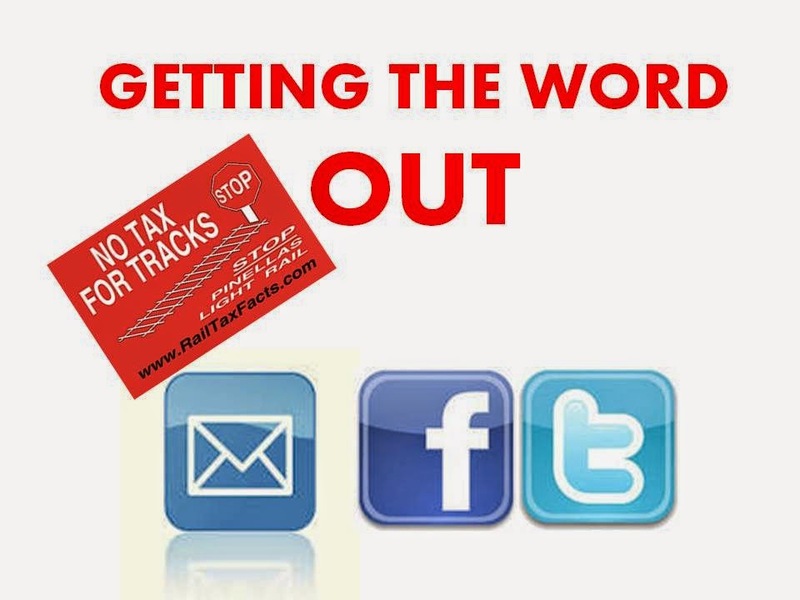 Disclosures: Contributor to No Tax for Tracks.